Christmas on a platter, drizzled with honey syrup and topped with chopped walnuts! 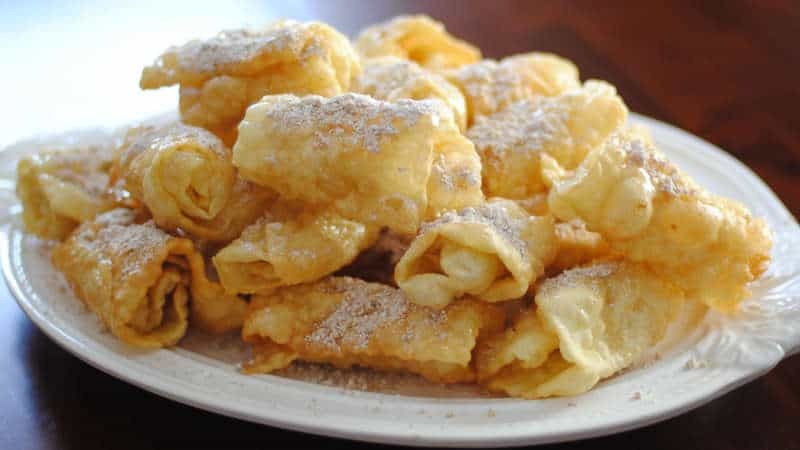 Diples get their name from the Greek word for “fold” and are a traditional festive dessert that is very popular around Christmas time throughout Greece. They are rather challenging to make, so we also included an easier version for you to make because you have to give it a go! Add the egg yolks one at a time, whilst mixing; wait for each one to be absorbed, before adding another. In a cup add the orange and lemon juice and baking soda and blend, until dissolved and pour in the egg mixture. Add the white wine vinegar and the sugar and mix. Pour the mixture in a large bowl or basin and sift in the flour; add the oil and knead the dough using your hands, until smooth and elastic, and not sticky (if it is sticky, add some more flour). Separate the dough in four pieces, cover with some plastic wrap and let it rest for 30 minutes. Using a rolling pin, roll out each part of the dough into thin rectangle sheets. Now you have to make a decision, whether you want to go the easy or the hard way! For the easy version, using a rolling cutter, cut the rolled out dough into rectangular pieces (approx. 10x5cm) or square pieces (8×8 cm). Heat the oil in a large frying pan, and deep fry the diples in batches of 3-4 at a time, depending on the how large is the pan, pushing them down with a fork and flipping them sides, until coloured. Place on some kitchen paper to drain and repeat with the rest. Prepare the syrup for the diples. Pour in a pot all the syrup ingredients and bring to the boil; boil for 5 minutes, until the sugar has dissolved (do not stir the syrup). Place the diples on a serving platter and drizzle with the syrup (or if you like them extra syrupy, soak each one in the syrup for a few seconds). Sprinkle with ground walnuts and cinnamon. Alternatively, just warm up the honey, drizzle the diples and garnish with chopped walnuts. Enjoy! I know my Sicilian grandmother made something similar. She actually stored them in a sealed tin. Room temperature. Usually around Christmas. They usually drizzled with honey. Hope that is helpful. PS. Even if the shape isn’t quite right, they are still delish! !